Donald A. Stevens of Gowanda, NY and Crystal Springs, FL passed away peacefully Sunday morning, March 10, at Hospice in Cheektowaga, NY. A veteran of World War II, he was 97 years old. Donald was born the son of Kate and Lloyd Stevens in McGraw, NY and graduated high school there. After a brief period working in Baltimore, MD, he enlisted in the Army Air Force in 1942 and began training in flight school. Donald's military years began where he flew a new B-17 FLying Fortress to Foggia, Italy from Savannah, GA, starting a career totaling 35 missions. Perhaps most noteworthy of all was a bombing run over the Ploesti Oil refineries in Romania where his plane was hit by anti-aircraft fire, knocking out an engine and making the return flight particularly harrowing. Escorted out of Romania by P-51 Mustang fighter planes, the crew was forced to reach their base maintaining just enough altitude to clear the mountains and land safely with no fuel showing on their gauges and no hydraulics to lower the landing gear. 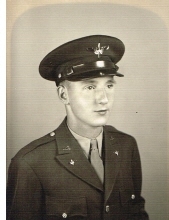 Donald was awarded the Distinguished Flying Cross among other medals and ribbons and after 28 years in the Air Force Reserves, he retired as a Lieutenant Colonel. When the war ended, Donald returned home where he married his high school sweetheart, Elva Russell, his wife of 67 years, and later graduated from RIT with a degree in mechanical engineering. He worked most of his career with Alliance Tool and Die in Rochester, NY, retiring in 1984. Survivors include a daughter, Diane (Quentin) Dye of Gowanda, granddaughters Katie (Tom) Bohn of West Chester, OH, and Amelia (John) Jarzynski of Lawtons, NY. He is also survived by great grandchildren Carolyn and Cecelia Bohn and Quentin and Henry Jarzynski, plus several nieces and nephews. Besides his parents and his wife, Donald was predeceased by a brother, John. During his life, Donald enjoyed golf, boating, and a daily cigar. With his wife, he was a member of the United Methodist Church in Greece, NY and Crystal River, FL. He was also a Mason and a Shriner. Memorials may be made to Hospice Buffalo, 225 Como Park Blvd., Cheektowaga, NY 14227. Arrangements are under the direction of Mentley Funeral Home Inc., 105 East Main St. in Gowanda. To send flowers or a remembrance gift to the family of Donald A. Stevens, please visit our Tribute Store. "Email Address" would like to share the life celebration of Donald A. Stevens. Click on the "link" to go to share a favorite memory or leave a condolence message for the family.